This is the end of the forty fifth chapter Of the book Ayodhya of the holy Ramayana composed by Valmiki as the first epic. Hearing the words and after acting according to them and after bringing the chariot to Rama, he told. This is the end of the forty sixth chapter Of the book Ayodhya of the holy Ramayana composed by Valmiki as the first epic. Overcome with grief , they saw it without joy , like a sky without moon and ocean without any water. This is the end of the forty seventh chapter Of the book Ayodhya of the holy Ramayana composed by Valmiki as the first epic. This is the end of the forty eighth chapter Of the book Ayodhya of the holy Ramayana composed by Valmiki as the first epic. This is the end of the forty ninth chapter Of the book Ayodhya of the holy Ramayana composed by Valmiki as the first epic. This is the end of the fiftieth chapter Of the book Ayodhya of the holy Ramayana composed by Valmiki as the first epic. “Along with lovely junctions of roads , undivided great roads , blessed with gardens and palaces , shining with courtesans , crowded with horses and chariots , echoing with sound of trumpets, filled with all sort of auspiciousness , with well nourished contented people , having many gardens for recreations , with community fairs and festivals , the capital of my father would continue to exist happily. This is the end of the fifty first chapter Of the book Ayodhya of the holy Ramayana composed by Valmiki as the first epic. The greatly lustrous Rama along with as per shastras , with great pleasure , did Aachamanam(inner cleansing) with the waters of river Ganges and saluted the river and Lakshmana also did the same. Sumanthra with great sorrow was continuously watching Rama , till he reached the other side of the river and when he could not see him due to long distance , he turned away his gaze and shed tears. 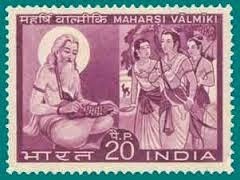 This is the end of the fifty second chapter Of the book Ayodhya of the holy Ramayana composed by Valmiki as the first epic. This is the end of the fifty third chapter Of the book Ayodhya of the holy Ramayana composed by Valmiki as the first epic. This is the end of the fifty fourth chapter Of the book Ayodhya of the holy Ramayana composed by Valmiki as the first epic. This is the end of the fifty fifth chapter Of the book Ayodhya of the holy Ramayana composed by Valmiki as the first epic. 56. Rama starts living in Chithrakuta. This is the end of the fifty sixth chapter Of the book Ayodhya of the holy Ramayana composed by Valmiki as the first epic. 57.Sumanthra reaches back to the mourning Ayodhya. Seeing on his way , the scented forests, rivers, lakes , villages and towns, he travelled with great speed. Having heard the great noise of wailing from the private apartment of the king , all the young and old people as well as women of the city , screamed and again the city was again filled with confusion. This is the end of the fifty seventh chapter Of the book Ayodhya of the holy Ramayana composed by Valmiki as the first epic. This is the end of the fifty eighth chapter Of the book Ayodhya of the holy Ramayana composed by Valmiki as the first epic. “Oh lady Kausalya, I am immersed in this great ocean of sorrow, whose breadth is separation from Rama, whose shore is the sorrow of separating from Sita, whose turbulent waves and whirlpools are the tortured breaths , whose turbid waters and foams are the tears , whose multitude of fishes are the waving of the hands , whose great sound is the cries of agony , who has water algae spread like disheveled hair , whose fire is the mouth of Kaikeyi , whose tides are the flow of tears and whose monstrous crocodiles are the words of the hunchback .The malicious boons of Kaikeyi are the shores where Rama has been exiled .What a pity that I would not be able to cross this sea while being alive. That famous Dasaratha who was greatly desirous of seeing Rama and Lakshmana , was unable to get them there and then he cried likes this inauspiciously and he fell down unconscious on his bed. This is the end of the fifty ninth chapter Of the book Ayodhya of the holy Ramayana composed by Valmiki as the first epic.